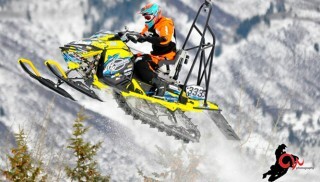 It was a golden weekend for Garrett Goodwin, as he rode his Goodwin Performance/DooTalk.com sled to the Snocross Adaptive victory at the Winter X Games in Aspen, Colo. 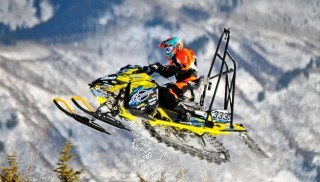 The gold is also big news for the Snowmobile.com Network, as DooTalk.com members help support Goodwin’s racing efforts. To learn more about DooTalk.com’s racer support program, visit http://buylaps.dootalk.com/. Goodwin avoided trouble at the start of the Snocross Adaptive final, settling into second place behind Jeff Tweet. Tweet managed to hold off Goodwin until the beginning of the second lap, when the DooTalk.com-sponsored racer made the pass for the lead. It was looking like smooth sailing for Goodwin, who was cruising along with a nice lead until a mistake on lap 4 brought saw Doug Henry get right up to his tail. Goodwin managed to retain his lead, but Henry very nearly made a pass at the end of the lap. Goodwin smartly cut off Henry’s passing line and extended his lead as Henry had a bit of trouble getting going again. Henry gamely tried to close the gap, but Goodwin built a sizeable lead, which he held through the sixth and final lap. Goodwin finished with a time of 6:25.099, nearly seven seconds ahead of Henry. Jim Wazny earned bronze, finishing about 15 second behind Henry.